With the expanded final tournament format featuring 24 teams, the 51 matches played across four weeks saw an exceptionally strong broadcast line up. Nearly two billion viewers have already tuned into UEFA EURO 2016 live matches, with each game attracting a live audience of more than 130 million viewers. The final is expected to attract a live audience of more than 300 million viewers. Many of the world’s leading free-to-air broadcasters were joined by the very best specialist sports channels to provide football fans across the world with cutting edge coverage of the tournament. Traditional linear television broadcast supported by an unparalleled digital offering enabled fans across the globe to follow and enjoy UEFA EURO 2016 to the fullest. 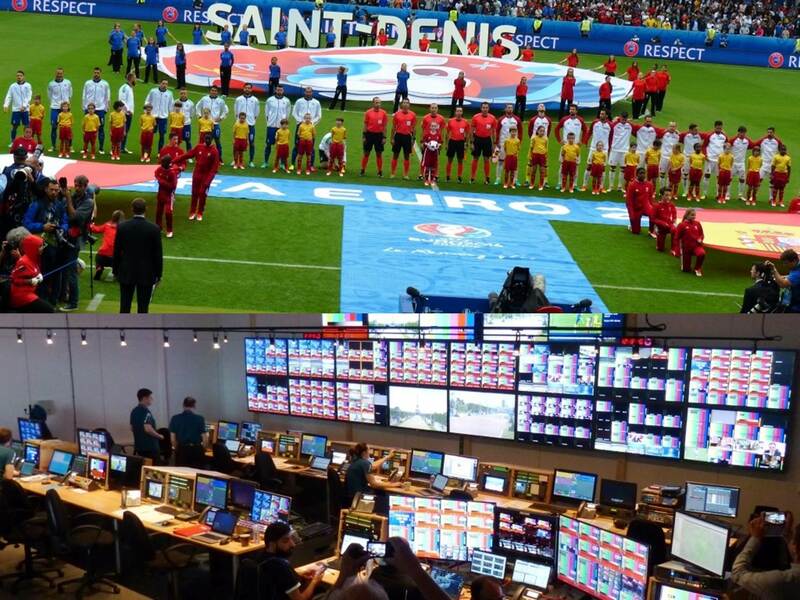 As was the case in 2012 and 2008, UEFA was taking the television production for UEFA EURO 2016 to a new level. As the host broadcaster, UEFA centrally produced the ‘world’ feed and provided its broadcast partners with 16 dedicated feeds from each match, an extensive catalogue of additional programming and all unilateral services and facilities were delivered via the 17,000m2 International Broadcast Center (IBC) in Paris and at the ten venues. 36 live match cameras were deployed at each stadium to capture the match as it unfolds and, for the first time at a EURO, eight matches - the opening match and the quarter-finals were broadcasted in 4K while the semi-finals and the final - will be produced in 4K UHD with 12 cameras involving 4K OBVans from France (AMP VISUAL and EUROMEDIA) and the UK (Telegenic). UEFA ensured that broadcast partners and their audiences were able to access content from the tournament on more platforms and devices than ever before, including mobiles, tablets and smartwatches, as part of their long-term commitment to broadcast and technical innovation. With the new 4K broadcast vans Mediapro is consolidating its position as a technology benchmark with the possibility of a broadcast quality 4 times better than HD broadcasting. Over the last year, Mediapro has produced a host of football matches from the BBVA League including last season's two Barcelona Madrid matches”. Mediapro Turkey has successfully produced a variety of events in ultra HD 4K, such as the Indoor Athletics Championship in Istanbul, UEFA Europa League and UEFA Champions League games. Outside sports events, highlights include the broadcast of the first ever conference on Ultra HD, “Satellite, Space and Technology Days powered by TURKSAT” as well as the recording of the last two editions of the Mercedes-Benz Fashion Week Madrid. Mediapro has currently reached 4K production agreements in Portugal and Turkey. For clients requiring 4K-production for their events, Exclamation’s design also offers 4K quad-link capabilities, with a Grass Valley Kayenne 4K-ready switcher, Aja KiPro recorders, and audio production and recording gear built around a Studer Vista X mixing console from HARMAN Professional Solutions. The road to Exclamation’s launch began in mid-2015 when TNDV Owner and President Nic Dugger identified a need for a new flagship video and audio truck that aligned with the needs of the largest broadcast networks and live events. Exclamation has already provided support for one of the largest annual corporate events held by a well-known Arkansas retailer. And by the end of June, it will have serviced a Baptist convention in St. Louis, a two-week live music event at the Music City Center in Nashville, and a special broadcast event at the Dolby Theater in Los Angeles. New for the returning season, the final six episodes of Super Girl were broadcast live on imgo.TV, an Internet TV platform affiliated to Hunan, with more than 35 million active viewers per day. The shows featured performances from final competing contestants with commentary from five professional judges on stage, plus two guest performing artists. The biggest technical challenge was handling the mixture of handheld and headset microphones and various open mics, which was managed by GLD’s Automatic Mic Mixing (AMM) feature. GLD’s AMM can be configured to work across all 44 microphone sources, allowing the user to select which inputs should be auto-mixed without the usual restrictions of a 16 channel insert based system. The studio will demonstrate what the industry can achieve, showcasing the scalability and benefits of Sony's Networked Media Interface, which delivers low latency and noise-free switching of HD and 4K video, audio and metadata via standard network infrastructures. It will also support IP initiatives as a hardware tool and establish itself as a prime training ground for professionals, in line with the strong heritage already established by Sony at Pinewood Studios. The IP Live Studio will serve as a ‘playground’ for partners that are part of the IP Live Alliance, allowing them to interface their own equipment with the Sony system. With the range of IP-compatible software and kit expanding across the industry, the DMPCE’s platform will allow partners to ensure their customers can interact with different workflows thanks to the help of Sony’s technology. The new AMP VISUAL TV Millenium Signature 12 truck was the center of the worldwide broadcasting of the event. The Millenium Signature 12 was designed in-house and with 76sqm floor surface it can be considered as one of the most spacious OB trucks in Europe, if not worldwide. System integrator Preview fitted out the interiors according to the AMP VISUAL TV’s specifications. The capabilities of the AMP VISUAL TV truck were certainly highlighted effectively during Le Mans 24 Hours. The two control rooms produced the international signal for around 35 million television and internet viewers around the world. The secondary production room focused on the activity in the stands, whilst the main production room handled a total of about 45 cameras deployed around the racing circuit and 52 RF camera systems embedded in the racing cars. To put that in perspective, this means that news actually ties drama for the No. 2 most-watched content type, and sports is No. 1. When one-off specials like NBC’s Grease Live and competitions are combined with news and sports, it means that real-time programming now accounts for 61% (440.8 million of the 718.9 million total 18-to-49 C3 impressions measured by Nielsen) for the past broadcast season. This varies by network, and as previously mentioned, NBC is the most reality-heavy when it comes to ratings, with nearly three-quarters (74%) of its targeted ratings coming from that segment. Fox comes in at No. 2, with 70% of its ratings coming from live programming. The House of Rupert is a sports powerhouse as well, which has trickled over onto its broadcast network: Sports alone make up 58% of the channel’s live total. IEM 2016: biggest eSports event in ESL history! The finals of the tenth Intel Extreme Masters season were seen by more than 34 million unique viewers - a staggering 32% increase on last year. The three-day main event itself saw 113,000 fans stream into the Spodek arena and IEM Expo, with the finals of each Intel Extreme Masters tournament taking place in front of 10,000 fans in the sold-out stadium. The ESL relied on the experience of ARAM for the planning, design and technical production of all 5 stages including giant main stage and also 11 trade fairs booths. ARAM was responsible for the concepts and the complete technical and set designs of all stages including rental of lighting, multimedia, scenic, audio, trussing, rigging as well as custom made automation systems. Our annual print directory PURE LIVE will be published prior to IBC! The latest developments in sports and entertainment live-production. Designed by the celebrated Misty Buckley, following her work on Coldplay’s appearance at the NFL Super Bowl 50’s halftime show in February, the latest stadium tour sees a lavish explosion of colour accompanying the crowd-pleasing performances by the Chris Martin-fronted fivesome. This time around, Stageco is building the sub-structure for the 65m wide x 25m deep main stage, the 30m long B-stage runway and a C-stage on which the band play a short, intimate set amongst the audience at the rear of the stadium. The company is also responsible for the steel structures that support the central video wall and side screens, the rigging points, PA and spot towers, front of house risers and camera platforms. Staged at the Las Vegas Motor Speedway, it was EDC Las Vegas’ 20th anniversary, and nearly 350 Robe fixtures – 212 Pointes, 83 x BMFL Spots and 38 x BMFL WashBeams – graced Steve Lieberman’s epic design for the circuitGROUNDS stage. As the main production stage of the event, the star-studded line up included Armin van Buuren, Martin Garrix, Afrojack, Eric Prydz, Kaskade and numerous others. Steve and the team from SJ Lighting presented a completely new visual concept that incorporated lighting, video and set / structural design. The architecture was based on an enigmatic 360 degree coliseum look – classical lines with industrial attitude - a provocative, interesting and exciting environment to host some of the best DJs and music producers on the planet. Alpha Production Group provides audio, video, lighting and staging services for entertainment and corporate events. It purchased 16 Clay Paky Sharpys from A.C.T Lighting about 18 months ago and has a pair of grandMA2 Light consoles, which A.C.T Lighting also represents in North America. The Scenius fixtures mark an additional investment in the Clay Paky brand. In the Lauryn Hill rig the Scenius fixtures were mounted on downstage truss to serve as washes for the artist and her band. France's new Parc Olympique Lyonnais Stadium is using Riedel systems to redefine the live sports and entertainment experience. Together, the Riedel MediorNet real-time media network, RockNet digital audio network, Artist digital matrix intercom system, Acrobat wireless intercom system, and Performer digital partyline system provide a decentralized fiber-based network for flexible signal transport, routing, and processing, as well as communications, throughout the innovative building — including the technical facilities for Olympique Lyonnais TV. The versatile and scalable Riedel infrastructure allows the stadium's audio, video, data, and communications signals to be leveraged with speed and simplicity to meet the requirements of football matches and any other live event. Wuhan Wanda Dragone Entertainment Co. Ltd., co-owned by China’s Beijing Wanda Cultural Industry Group and The Dragone Group, has selected Clear-Com® wired and wireless intercom systems to control the live production of The Han Show, which takes place in Wuhan’s Red Lantern Theatre in China. This massive extravaganza is so big that it requires an astounding 632 intercom positions to manage it all, making it Clear-Com’s largest live performance installation in China to date. Featuring 95 artists, acrobats, and water divers performing awe-inspiring feats that are both beautiful and dangerous, The Han Show embodies the essence of China’s venerable Han culture in a live multimedia spectacular directed and staged by Cirque du Soleil alumni Franco Dragone of The Dragone Group. AJA Video Systems FS4 frame sync and converter supporting 4K, UltraHD, 2K, HD and SD workflows is now shipping. Encased in a sleek 1RU chassis, FS4 provides incredible flexibility for broadcast and ProAV professionals with a single-channel mode for 4K/UltraHD video processing and up, down and cross-conversion to/from 2K/HD/SD, as well as a four-channel mode for multi-channel density that enables four 2K/HD/SD channels of simultaneous conversion and processing. FS4 is available through AJA’s worldwide reseller network at a US MSRP of $4,995.00. NEP UK is strengthening its outside broadcast fleet with the addition of four brand new UHD trucks, equipped with the latest production equipment from Imagine, SAM, Telex, Calrec and other leading manufacturers. The trucks have been designed and built from scratch, less than a year since the devastating fire that destroyed five of NEP’s OB units. All four trucks have the ability to work standalone or together in any combination. They are able to interconnect with each other via a CWDM fibre system, and the configuration allows for 200 shared 3GB signals to be sent between the trucks. Equipped with UHD and HDR capabilities, the trucks are built around Imagine IP3 routers with hybrid IP / Base band router infrastructure and design. The routing infrastructure is the largest in NEP’s worldwide fleet. The tense Euro 2016 quarter final between Poland and Portugal made history in Italy, marking the kick-off of seven matches that national public broadcaster Rai is offering TV homes in Ultra HD. Said to represent the next big leap forward in broadcasting, the Ultra HD broadcasts were delivered to Tivùsat homes, equipped with an Ultra HD screen and a CAM certified by Tivùsat, by Eutelsat’s HOTBIRD satellites. CANAL+ group, Dolby and Euromedia have worked together to complete the world’s first ‘live’ commercial test broadcast to feature Ultra HD and Dolby Atmos® sound. The test broadcast was completed during the Top14 rugby final, between RC Toulon and the Racing 92 on Friday June 24th, 2016. Dolby Atmos sound fills your room and flows all around you with breathtaking realism to create a powerful entertainment experience.